LearnXNA.com has video tutorials and news articles. On the site right now are three tutorial videos. These videos are well done and easy to follow. So far, the videos cover installation of XNA, C#, and the DirectX SDK, as well as working with the various programs mentioned. This community site has no member sign up and discussions are handled in the comments section of the site's blog posts. With a few updates, such as community sign up and maybe submissions, this site could be even more useful. XNAspot.com has taken a more tradition approach. Available on this site so far are static tutorials, pictures, sample code, news, and a link to the MSDN forums. There is a submission page to submit articles, games, etc. This site also has no user accounts to sign up for and they no comments area to discuss anything, though they claim changes are coming to allow reviews of the community. I assume they will need to have a user accounts to keep abuse down on reviews and if they include a discussion area, this site will be a great one. Considering how new XNA is, both of these sites have great potential and are, so far, the best sources for tutorials for the XNA tools. The information available is well worth the time to check out. There is one other site to mention and that is Microsoft's MSDN site which is a community site devoted to programmers using Microsoft's products such as XNA, ASP.Net, Visual C#, etc and has been around for quite awhile. There is a section for XNA called the Microsoft Game Technologies Center. So, if you are wanting to start creating a game there has never been a better time than now. I am off to watch more video, play with some code, and learn how to create a game to dominate the universe. Have fun and happy coding. In the final piece in our "A Short History of..." series, Eric-Jon Rössel Waugh details the journey of id Software from a moonlighting programming outfit to a leader in 3D gaming technology. "Sony has always been at its best as a personal hardware company, coming up with nifty gadgets that delight consumers. In recent decades, though, it's become oddly fixated on imposing its own standards ? Betamax for VCRs, the Mini-Disc for digital music players, the Universal Media Disc for PlayStation Portable, the Memory Stick for anything you can think of ? despite the world's unwavering rejection of those standards. And Sony has never displayed an aptitude for software or had great success with networking, the key feature Microsoft has built into the Xbox. Yet Sony has to face Microsoft not just in videogames but across the entire panoply of home electronics, which Microsoft is determined to control through software. And Sony has to do this with cash reserves of $6 billion ? compared to Microsoft's $38 billion hoard ? while losing hundreds of dollars in manufacturing costs alone for every PS3 sold. Eventually, Sony's costs will come down. But in the meantime, Goldman Sachs projects, Sony will lose nearly $2 billion on the PS3 by the end of this fiscal year in March." "At its start, LucasArts didn't immediately latch onto the powerful Star Wars license as it does today. Eric-Jon Rössel Waugh explores the publisher's transition from titles such as The Secret of Monkey Island to Knights of the Old Republic." A prankster in Arizona released two live Diamondback Rattlesnakes in a theater full of people watching Snakes on a Plane. 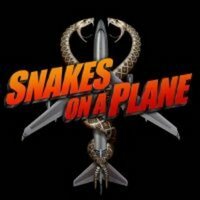 The following link has a video of the news coverage of this incident: CollegeHumor Movie: It's irresponsible and dangerous, but releasing poisonous snakes in a theater showing Snakes on a Plane is undeniably funny. "There is some shred of truth to the story, Phoenix police Sgt. Joel Tranter said. A 10-inch-long rattlesnake was found Friday in a hallway at AMC Desert Ridge 18, near Tatum Boulevard and Loop 101. But it likely slithered inside on its own, Tranter said." "An AMC spokeswoman told the news organization Reuters that the rumors were true, but Tranter has been refuting the story to news outlets from across the U.S."
So, there you have it. To quote a saying from Paul Harvey "... and now you know [pause] the Rest of the Story." " Microsoft's forthcoming Zune player is shooting to be the life of the party, allowing users to create mobile social networks and stream music to nearby friends or strangers, according to a government regulatory filing." "BATON ROUGE, Louisiana -- A state law that would ban sales of violent video games to minors violates free speech rights and cannot be enforced, a judge ruled." "Last week we announced XNA Game Studio Express, which is a product that enables students and hobbyist game programmers to create games using C# that will run on both Windows and their Xbox 360. The XNA Framework is the set of .NET libraries that developers will code against to build their games. As we get closer to the beta, I wanted to take a few moments and explain three keys to understanding the XNA Framework?namely, the goals of the XNA Framework, what the XNA Framework is, and what it provides." "Looks like Lumines Live tries to get sneaky on slipping you a couple of MS Point charges. After rumors a while back that there would be a charge for multiplayer (which proved to be false later), there are extra fees when you advance far enough into the single player "Mission Mode" and "VS CPU" mode." " "Creative is very fortunate to have been granted this early patent," said Steve Jobs, Apple's CEO. "This settlement resolves all of our differences with Creative, including the five lawsuits currently pending between the companies, and removes the uncertainty and distraction of prolonged litigation." Creative chairman and CEO Sim Wong Hoo called the settlement "amicable." "
"PS3: Twenty-seven playable titles will be presented at Sony?s booth, and 35 new videos will also be shown in a theater. Here's a large chunk of the 27 playable titles for PS3 at TGS 2006." Video games have been getting a bad rap. Sure, a few involve nothing more than pointing several deadly weapons at the Undead and blasting them into a bajillion pieces. And there are cases of people wasting otherwise productive hours conquering a virtual kingdom and accumulating pixelized gold instead of going out and getting a real job. But there are many, many times when video games actually provide a noble purpose in society. When they make you a better person. Or at least, a smarter person. Because there are video games that are actually built on logic and reasoning, and involve complex problem solving that you can take with you even after you?ve walked away from the computer screen. "Game developers, medical workers, and government policymakers will be meeting in September at the Games for Health Project. The Objective? To organize and accelerate the adoption of computer games for a variety of challenges facing the world today. In short, find other ways of making games work for humanity." * Xbox Live Vision. This package includes Xbox Live Vision camera, one-month Xbox Live Gold Membership, Xbox 360 Headset, and free* downloads of two full-version Xbox Live Arcade games: the popular "UNO®" card game and "TotemBall", the new 3-D platform game from Freeverse and Strange Flavour Ltd. that is a mixture of platform skills and puzzles (estimated retail price (ERP) $39.99 U.S.). * Xbox Live Video Chat Gold Kit. This package includes the Xbox Live Vision camera, a 12-month Xbox Live Gold Membership, an Xbox 360 Headset, free* downloads of three full-version Xbox Live Arcade games: the popular "UNO®" card game, "TotemBall", and the classic "Robotron" action shooter and 200 Microsoft Points (ERP $79.99 U.S.). * Xbox 360 Wireless Racing Wheel. For true racing enthusiasts who demand unparalleled driving realism at home, this innovatively designed wheel combines form and function with the latest technology in wireless and force feedback. Consumers who purchase the wheel will also get a limited-edition force feedback version of "Project Gotham Racing® 3" while supplies last (ERP $149.99 U.S., available in November). * Xbox 360 Wireless Headset. Providing the ultimate wireless experience, this headset integrates seamlessly with the Xbox 360 console to provide wireless voice chat capabilities, stylish design and superior voice quality over the Xbox Live network (ERP $59.99 U.S., available in November). * Xbox 360 Wireless Gaming Receiver for Windows. By plugging the compact receiver into a Universal Serial Bus (USB) 2.0 port on a PC, gamers can use Xbox 360 wireless accessories on their Windows-based computer (ERP $19.99 U.S., available in late December). * Xbox 360 Faceplates. Consumers can customize their consoles with one of three new special-edition faceplates featuring images from their favorite games, including the "Halo®" franchise, "Viva Piñata", and "Forza Motorsport 2" (ERP $19.99 U.S., available in early November)." "During a packed Xbox 360 and Games for Windows conference in Leipzig, the platform holder said that it had fashioned a deal to bring Pro Evolution Soccer 6 and FIFA '07 to Xbox 360 exclusively for the next 12 months - with no other next-generation versions to appear. It also reiterated that its HD-DVD drive would launch this autumn, although Xbox 360 heavy-hitter Forza Motorsport 2 will be here "this winter" having previously been labelled as "Christmas" - something we're seeking clarification on now. Later in the year, the company said, its Games for Windows branding campaign would come into full force, with a logo to be visible on many PC game boxes signifying compatibility, parental controls and other features set to become standard with Windows Vista." On overview documentary of the history of video Games from Atari to Nintendo. Very interesting video though Sega is missing from this documentary, it is still interesting the see how Atari and Nintendo got their start. Documentary cover video gaming from the late 60's to the early 90's. Marc Saltzman over at Yahoo! Games interviewed Need for Speed Carbon star Emmananuelle Vaugier. Playing the role as your ex-girlfriend in the game, she is one of the main characters in the story of the game. "What could be hotter than the racing action found in the upcoming Need for Speed Carbon? How about the woman who plays your past flame in the game? Emerging Hollywood actress Emmanuelle Vaugier -- best know for her work with the hit CBS sitcom, Two and a Half Men, as well as feature films Saw 2 and 40 Days and 40 Nights -- plays as Nikki, the ex-girlfriend of the hero who returns to his hometown to face his past." Activision is sponsoring a contest through Gamespot and SpikeTV to be on an episode of Game Head, Spike TV's video game series. To enter, all you need to do is go to the sign up page here: GameSpot: Game Head Call of Duty 3 Challenge and submit your video. * Upload your video showing us why we should select you to battle it out for Call of Duty bragging rights. Please make sure to include your face in the video. * Fill out the application provided after uploading your video. All applications and videos must be received by 11:59pm PDT on Sept. 4th 2006. * You must be able to be in NYC Sept. 20-22, 2006 (we will cover your expenses related to participating in the event--including RD trip airfare, accommodations, transportation and meals). * You must be 18 or older to apply; Unites States citizen or legal resident of the 50 United States. Think you have what it takes? Submit a video, you never know, you could be the grand prize winner! The Toronto Star reports that General Motors has announced the 2009 Camaro will be built at their Oshawa plant in Cananda. The car is not what you would think of as a traditional styled Camaro, but I think it is a very slick looking car. 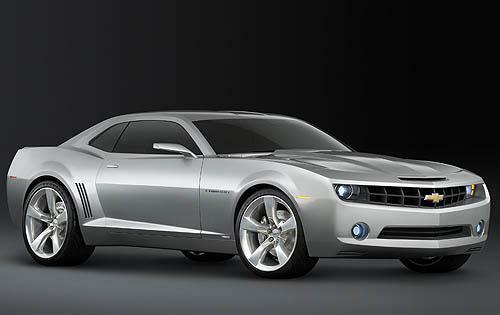 Not a bad read, check it out at: TheStar.com - Oshawa to build Camaro. To see some photos of the preproduction car, go here: Inside Line: Future Vehicle Photos. Can't help but think about the irony of a Classic American car being built in Cananda. London, 18th August 2006: Steorn, an Irish technology development company, has today issued a challenge to the global scientific community to test Steorn's free energy technology and publish the findings. Steorn's technology is based on the interaction of magnetic fields and allows the production of clean, free and constant energy. The technology can be applied to virtually all devices requiring energy, from cellular phones to cars. Steorn has placed an advertisement in The Economist this week to attract the attention of the world's leading scientists working in the field of experimental physics. From all the scientists who accept Steorn's challenge, twelve will be invited to take part in a rigorous testing exercise to prove that Steorn's technology creates free energy. The results will be published worldwide." First heard on Team Xbox. So, I am sitting at home when the phone rings. I answer the phone and on the other end is none other than Samuel L Jackson! He smarts off and tells me all about his new film coming up, how I should take time away from my job on the 18th, after all it is only one day, to go see his movie. That I need to quit doing this or that and jump in my wanna be monster truck(I drive a Nissan Frontier) and head on out to see it. Rockville, MD - August 14, 2006 - Bethesda Softworks® announced today that all five actors who portrayed the STAR TREK series captains -- William Shatner, Patrick Stewart, Scott Bakula, Avery Brooks, and Kate Mulgrew -- will provide voiceovers in the STAR TREK: Legacy video game. The collaboration marks the first time the five actors have participated in a single STAR TREK project together. STAR TREK: Legacy places you in the role of the Admiral of a task force of warships, which you control in small and large-scale battles. Test your strategic and tactical skills in real-time combat featuring over 60 authentic spaceships, full damage modeling, and spectacular visual effects. Play through the single-player campaign or in the extensive multiplayer mode with a group of friends online. The compelling storyline in Legacy spans the entire STAR TREK Universe, including the Original Series, STAR TREK: The Next Generation®, STAR TREK: Deep Space Nine®, STAR TREK: Voyager®, and STAR TREK: Enterprise eras. Mad Doc Software, also working on this project, has some great screen shots of the STAR TREK: Legacy game. Picture courtesy of Bethesda Softworks®. 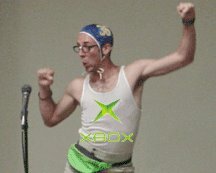 Microsoft Invites the World to Create Its Own Xbox 360 Console Games! The Halo movie finally has a director... Xbox 360 News reports that Neill Blomkamp, a Vancouver-based director of short films and ads, will direct this film. They have a video of one of the guys films over at Xbox 360 News- Halo Movie Director Named. I am not too sure this is more than rumor, I have seen no other news on it. But, if it is true I have to say I think going with someone unknown can be risky but might get the look and feel Bungie is looking for in the movie. An official statement from Microsoft has revealed that the motion picture based on Bungie's Halo franchise will be helmed by Neill Blomkamp, a short film and commercial director making his feature film debut with the movie. Mary Parent, Scott Stuber and Peter Schlessel will produce Halo. The film is currently targeted for a Summer 2008 worldwide release. Halo will be shot in Wellington, New Zealand, and will make use of the full range of executive producer Peter Jackson's state-of-the-art production and post-production facilities there, including Weta, Stone Street Studios, and Park Road Post. The release from Microsoft also mentions latest figures for the video game franchise: "Halo and its 2004 follow-up Halo 2 have sold a combined 14.5 million copies worldwide and grossed more than $650 million (U.S.). 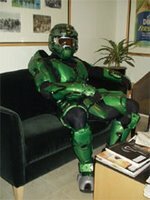 On November 2004, Halo 2 shattered records with $125 million in first-day sales." Richard over at Aeropause - The goods on gaming has an article that is almost as funny as his topic. Fanboyism! He found 4 Fanboys and interviewed each one. Comparing their answers and interposing his opinion on the whole issue makes for a great read. I claim to be a fanboy sometimes but these four guys take the cake. I am an Xbox 360 fanboy, to an extent. I just do not believe I have it as bad off as these guys. Some of the other consoles have their selling points but the Xbox caught me at the right time with the right money, I have made the investment and try hard to support my choice. Will I buy any of the other systems soon to be released? More than likely but not because I personally want them but because my whole family is gaming and I really do not like to share my 360, in fact I have been considering getting a second one. It will cost less than buying a PS3 though. The awesome Fanboy picture courtesy of Aeropause, best Fanboy picture I have seen to date. Fifteen years ago, Tim Berners-Lee sent a post to Usenet about a project called the WorldWideWeb, the WWW project. This is considered the birth of the WWW so happy 15th birthday WWW!! To Sir Tim Berners-Lee I say thank you! 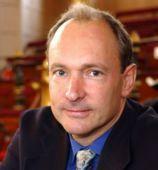 Check out the Wikipedia entry for more information about Tim Berners-Lee. The Sony PS3 is set to release on November 17, 2006 in the US. Guardian Unlimited Technology asks the question Is Sony fighting a losing battle? This article is an interesting read and I would have to say hit on a few key points in Sony's PS3 release. Sony lost me with the hard drive they put out for the PS2. After all the hype, they dropped it like a rock once it was shipped, quietly they let it, and everything they announced for it, die. Then they released the PSP and it has not lived up to half the hype Sony pushed on us. So, looking at their track record, I would have to say, unless Sony pulls it head out of it's proverbial backside and get with the program, they will loose. The article is a good read and has some good points. At the end of the day, I expect the PS3 will be a hit, partly because it will be the cheapest Blue-Ray drive on the market, about $400 cheaper than their stand alone Blue-Ray drive, after all. If Sony does not clean up it's attitude toward the gaming community, being the cheapest Blue-Ray drive might not even help. You can' treat people like they are beneath you and expect them to buy your products.